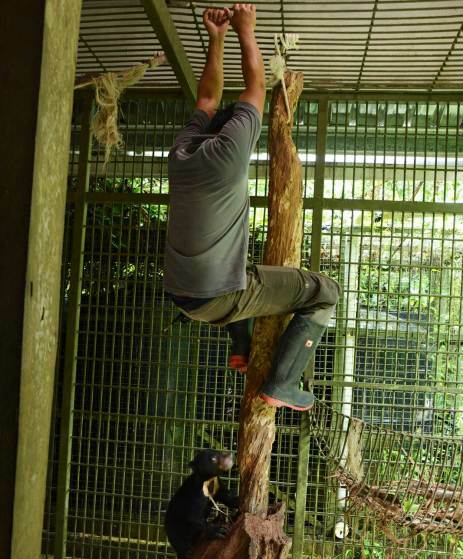 Oyster volunteers help out at a rescue centre for sun bears in Borneo, helping them to rehabilitate to life as close to the wild as possible. This rescue centre has sadly seen many new arrivals over the past 12 months, but we are delighted to say that they are all doing so well. Here we showcase where some of these bears have been rescued from, and the importance of this fantastic volunteer project with sun bears in Borneo. 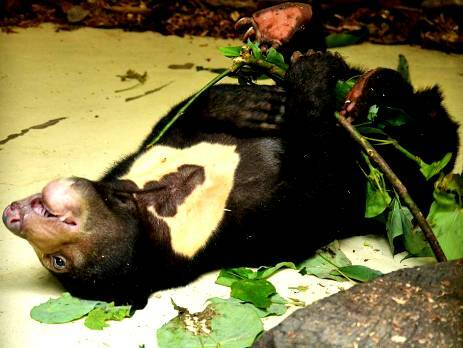 Sika was just four months old when she was rescued and brought to the sun bear centre. She was being kept in a rural village in remote Borneo in a tiny cage of chicken mesh, and being fed a diet of milk, fruits and cereal. She was spotted by a foreign traveller who reported this to the authorities, who were soon able to confiscate her. Sika spent the first few months at the centre in intensive care. Here she was given a balanced diet and was monitored closely, due to the trauma that she will have suffered in her early months. Despite this, she is growing strong and loves to climb. After her time in intensive care, Sika was moved to quarantine to focus on enrichment to start stimulating her mentally, and preparing her for life in the wild. This involves teaching her to fend for herself, such as play fighting. The next stage for Sika was to take her out in to the forest for walks. She was still very nervous of the forest and to leave the safety of the quarantine enclosure. To build her confidence, Sika was moved into a larger exercise den, which reflected life in the wild as much as possible, with dens, leaves, dead wood, climbing structures, a platform and treats. Sika overcame some great nerves and stress to become used to her new environment, but this did take time. 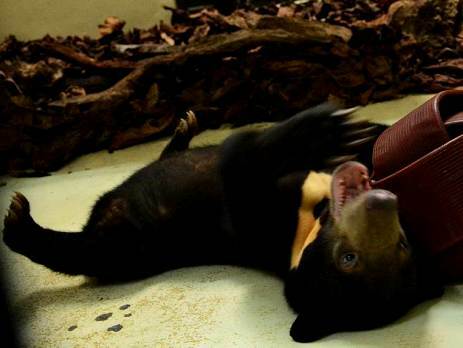 Rehabilitation is never a quick process, especially when bears have been through the stresses that Sika has. For over a year, baby Kina was kept illegally as a pet. Her owner claimed that Kina’s mother was knocked down by a car, leaving baby Kina, whose eyes weren’t yet open, to fend for herself. The owner took her in and kept her in a cage for over a year, until she was given to the local wildlife authorities to care for. 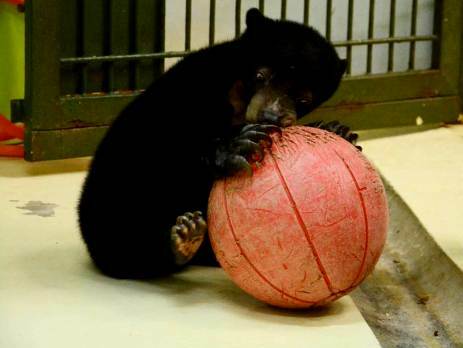 Due to the time that she spent in captivity, Kina was very small for her age. She showed signs of malnutrition, had small canines and a small head in comparison to the rest of her body. She lacked sufficient nutrients for her growth, most probably due to being fed inappropriate foods. Upon arrival at the centre, she was given more appropriate foods to help her grow into a strong little bear. Despite her bad condition on arrival, Kina adapted quickly to life in quarantine and immediately took to the enrichments such as logs, balls and hidden food. She is particularly keen on honey, and seems to enjoy covering herself in it. She has also learned to climb, and loves to be up high.She really enjoys the enrichments as they keep her stimulated, and often an entire day can be spent playing with some branches or a log! As Kina had been kept as a pet, she arrived at the centre fully habituated to humans. This has had its pros and its cons. A positive side of this has been that some of the bear experts at the centre have been able to work closely with Kina, teaching her to climb and to play fight. Once Kina picked up these basics however, a lot of time was spent weaning her off human contact and introducing her to other bears. There are many things that Kina can only learn from other bears, such as building a tree nest and foraging, and so it was important that she start to socialise with other sun bears as soon as possible. To find out more about becoming a volunteer with sun bears in Borneo, see our volunteer with bears webpage.